My son and daughter-in-law "invited" me to share space with them on their table at a holiday bizarre. I rose to the bait. Silly me. I decided to sew some gift bags. They did not turn out too badly. I came up with the design and winged it. The dimensions I used are for demonstration purposes only. Adapt the design to make any size you need or want. I apologize for my less than stellar photography skills. Before we begin, I would like to introduce my best frenemy. I call my seem ripper "Clover" because that is the name that was on the package. I credit my friend Susan with pointing this out. My sewing skills make spending a lot of time with Clover a necessity. Don't be discouraged if you too have to rip out and redo seams. A willingness and determination to get it right goes a long way. Begin by deciding how big you want your bag. For strength we are going to make both large sides and the bottom of the bag out of one continuous piece. Imagine the side panel. Determine the size. How about the bottom of the bag? I decided I wanted my bag sides to be about 9 " tall X 10 " long. I wanted the bottom to be 3 " deep. That meant that my main piece of material for the outer shell needed to be at least 21 " X 10 ". 9 + 9 +3 X 10. I added an inch for the seams. It is a holiday bag, so I figured it needed some sort of decoration. I decided on green triangles on each side. Abstract Christmas Trees. No need to get too carried away. Feel free to go as crazy with the adornments as you want. Someone suggested LEDs or maybe incorporating a wearable device. I am no where near that talented or imaginative. I used the tape measure to remind myself of the location of the center of the bottom of the outer shell. I am a big fan of glue sticks. Pins are just too much trouble for something like this. I placed my triangles allowing for the bag bottom and making sure they had the correct orientation. I used a zigzag stitch in a contrasting color. As I have said before, do what makes you happiest. On further reflection, I should have used a handle material that contrasted with the main bag material. It would have made for better photographs. Too late now. I looked for handle material at the local fabric shops. They are VERY proud of their webbing. I finally went to a local climbing/outdoor store and bought nylon webbing for $.30/foot. Much less expensive than anything I could have gotten at the fabric store. The big plus is the webbing I used is rated for way more weight than could ever be carried in the bag. Everything else might fail, but the handles will endure! How much webbing do you use? Double the length of the outer shell and then add as much as you need for the handle loops. Find the midpoint of the webbing and place it at the midpoint of the outer shell. Sew the webbing to the outer shell. then loop it around and place the end at the outer shell midpoint on the other side of the decoration. Make sure to stop your seam a couple inches from the end of the outer shell. This will leave room for trim around the top of the bag. Trim covers a multitude of sins. Sew the other handle loop and the bag has handles. The sides of my bag contrast from the main panels. I figured if I was going to go to this much trouble, I wanted it to be obvious. The side panels should be cut using the same dimensions used when calculating the size of the main outer shell. In my case I cut them to 4" X 10". You will need 2 of them for this step. I cheated by folding my panels in half and pressing them to make the centers evident. This helped me a lot when aligning things. Note that I am sewing the sides to the outside surface of the main outer shell. This way when it is turned right side out it will hide the seam. I know this is basic sewing technique, but variations on this theme lead to quality time with Clover. Sew the bottom of the side first. Sewing from the center out results in less time with Clover in my experience. It is kind of tricky and awkward, but fold the cloth and sew the sides. Repeat for the other side panel. Now turn the bag right side out and feel a sense of accomplishment. Now for the liner! A single ply bag will not do. Cut the main piece of the liner to the same dimensions as the main piece of the outer shell. We would like it to fit without too much unused space. Cut the side panels to the same dimensions as the shell side panels. Repeat the process for sewing the side panels used on the outer shell. This went faster because there were no decorations or handles. Turn it inside out. We want the finished side to be the inside of the bag. This is the hardest step. Sorry about the lack of pictures, but my frustration level was fairly high during this step. Turn the liner inside out again. Make sure the side you want visible is next to the outside of the outer shell. Really, trust me. Then sew one long side of the liner and outer shell together. Be brave. Then turn the corner and sew one side together. You will notice that things are getting a bit twisted at this point. Turn the whole thing inside out and sew the other long side. Now stop sewing for a minute. The bag looks hopelessly inside out right now. Find the remaining unsewn end. Pull the bag through the opening until it is right side out. Sew the last end shut. Marvel at your clever craftiness. Note: The helpful cat in the picture is named Omar. Yes, after the character in The Wire. Draw your own conclusions. He was a BIG help. I found that wide ribbon makes a great trim material for the bags. I cheated with the pressing again. I pressed the ribbon lengthwise so it would be evenly inside and outside. I tried glue stick, but it was not up to the task. Pins were the answer. 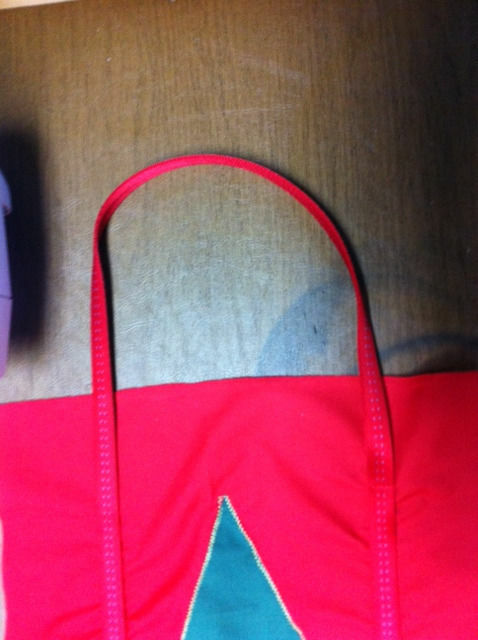 Sew the trim into place. Now you can set back and bask in the glow of your finished bag. Unless you were like me and committed to sewing twelve of them. The last picture is of bags on display at the actual Craft Bizarre. Sorry about the blurriness. Those pink things nest to the bags are homemade scented soaps. The soaps sold better than the bags. PS. I know I used "bizarre" when I should have used "bazaar". In any case it is better than "Crap Fair". Love this bag by the way!